Chelsea boss Maurizio Sarri insisted that Alvaro Morata was ‘unlucky’ in front of goal against PAOK Salonika after his dismal display in Greece. The Spaniard fire blanks for the Blues in Thursday night’s Europa League clash, missing several guilt-edge chances to extend the team’s lead and struggling to compose himself in the final third. Sarri’s men ultimately emerged 1-0 winners thanks to a 7th minute Willian goal, however, the final scoreline would have been far more convincing if Morata had made the most of his opportunities. That’s the way to start the group! ? The 25-year-old moved to Stamford Bridge from Real Madrid in 2017 and hit the ground running in his opening couple of months in England, scoring six goals in his first 6 games. Unfortunately, since then he has struggled to find the net on a consistent basis, scoring just 3 goals so far in 2018, despite featuring in the starting line up regularly. 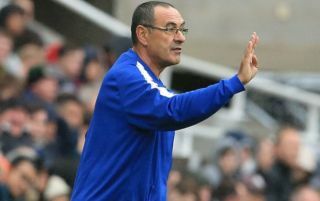 Sarri replaced Antonio Conte as Chelsea boss this summer and has quickly tired to implement his free-flowing, fluid passing philosophy at the club, which has seen the likes of Eden Hazard and Pedro flourish in more attack-minded positions. The Italian boss might have hoped for the same for Morata and he is still willing to excuse the striker for his performances, according to Four Four Two, as he touched on his confidence issues post-match addressing reporters in Greece: “Alvaro has to gain confidence with one, two three goals. “I am not able to give him confidence. “In this match he had three or four opportunities. He was unlucky. I hope for him in the future I can help him. But the confidence can come with goals. The Spain international has started four of the Blue’s five games in the Premier League this season, scoring once, but was left out of the starting line up for their most recent clash against Cardiff City last Saturday in favour of Olivier Giroud. If Morata continues to misfire, there is every chance that Giroud will take over as the club’s number one forward, which at this point might actually excite supporters, given their need to continue picking up wins at the top of the table. The former Madrid man is running out of time to save his career at Stamford Bridge, but Chelsea have maintained their perfect start to the season with yet another win and look set to challenge for titles, with or without Morata.